Entertainment packages on Telstra phone plans (content as they call it in the industry) are here and they’re important. Both for the industry and anyone with a phone. Our suggestion is that you don’t underestimate the influence entertainment packages are going to have to the phone plans you end up getting, (or avoiding) from now on. It used to be a combination of network coverage and price trade which attracted you to a phone company. It used to be the phone and the subsidy (basically the price they’d sell you an iPhone for under a 24 month agreement which decided which Telco brand you’d choose.) Things have changed. The inclusion of entertainment options (access to music and video on your phone through the phone company network) in to Telstra’s plan range is a fundamental change for users. It will alter how and why we make the decision s we do about whether Vodafone, Optus or Telstra are right for us. In this article, we examine Telstra’s entertainment options and how you can navigate the minefield. Telstra entertainment – what is it ? Here’s a quick summary of how all of these things tie together to constitute Telstra’s content offering. Telstra announced a new range of entertainment inclusions on their phone plans in spring 2016. The news involved a re-positioning of some of the other media assets they already held. The result is a tiered system of entertainment options broadly associated with the spend their customers have on their plans. Here’s a quick summary of how all of these things tie together to constitute Telstra’s content offering. Specifically, Telstra now offer. Every Telstra customer whether they are prepaid or postpaid will get access to Apple Music. Apple Music is just one of a number of streamed music and radio apps but it’s one of the most famous. Apple is a reputable brand for Telstra to be partnering with. Remember, the data you use streaming music or radio in this way is not counted against your plan. As we’ve covered in other articles, streamed audio can use two or three GB a month of data. Included audio is a worthwhile service to consider and, importantly, it has been included at the previous headline price of Telstra’s plans. In other words, for now, you don’t have to pay for it. This was the ‘existing media asset’ to which we alluded above. Again, whatever the Telstra service (prepaid / postpaid / contract) you have, you’ll get access to a single season per year of either the NRL or the AFL. If you want the second subscription, you’ll have to pay around $100 for it. It’s worth noticing that Telstra are extending this sporting offering to include a slightly broader range of sport entertainment options. They recently acquired the right to some Australian basketball, for example. This is likely in response to Optus’ announcements around the EPL and OVO Mobile’s provision of Australian gymnastics and Australian Drag Racing. For some high spend plans (see infographic), Telstra has a frankly quite amazing facilities. For now, Telstra are offering their customers not just 3 months access to Stan and Preston but the data to watch it. Just to be clear that’s different from Optus’ offer. With Telstra you are given both the streamed video service and the ‘unmetered’ (zero rated / not charged for) data you need to watch it for a trial 3 month period. 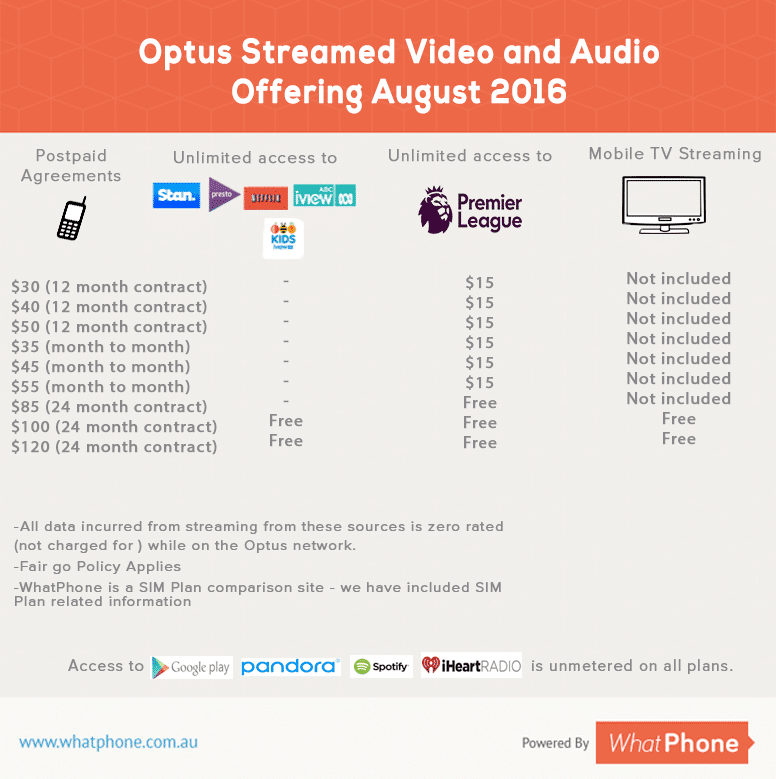 With Optus, you can stream the data at an unmetered rate (for a fee of $10 per month) but you must have the streamed video account, first. They won’t pay for it. We have a separate article which covers the critical differences in Optus and Telstra’s offers. Now smaller phone companies offer the core of phone services capabilities and charge far less for them than either Optus or Telstra. Telstra are investing in entertainment services because they have to. Selling entertainment services is not something most people would immediately expect from Australia’s biggest phone company. It’s a change from a company not necessarily renowned for loving change. From that, you can probably deduce, there is a burning platform which Telstra has to worry about. Or perhaps more than one! Telstra face a number of parallel threats, from multiple sources, which are driving them to think and behave differently. Here’s what our analysis suggests is really behind their entertainment options. Here are the real reasons Telstra are investing in entertainment and content. Think of it this way. You’re Telstra. You’ve spent literally billions of dollars dispatching engineers around the country to build you a 3G network. Then you do it again with a 4G network. You populate enormous call centers with people staffed to answer the questions of the people who use that network. You shell out countless billions more on phones, which you subsidize to entice people to use the network you’ve built. Then, companies that you previously didn’t even consider a competitor, like WhatsApp, build their business as an ‘over the top player’. WhatsApp, who have never built a network in their life use your network as part of their service – and they don’t pay you for it. In so doing, they destroy your SMS revenues. And it’s not just them. YouTube does the same. Google and SnapChat too. And all the others. People on buses constantly use these services over the Telstra network and Telstra doesn’t get a red cent. The question for big T, as it considers these specific moves and the trends that they belie is ‘how do we make money out of these things.’ One answer is to charge a fixed fee for access to particular services (say all you can eat Netflix, for $10 a month, for example) This pushes Telstra towards offering content at a flat fee and helps them, at least to a degree monetize what’s happening. We cover companies like Boost Mobile, Kogan Mobile and Amaysim thoroughly on this website. These companies and others like them, many of which you will see on our prepaid and SIM Only pages smaller phone companies are also known as network resellers or MVNO. They used to be considered the Aldis of phone companies. Next to Optus, Telstra and Vodafone, they represented the lower end of the market as Aldi does to Coles and Woolies. MVNOs have stimulated competition around pricing and inclusions against the major telcos and snapped up many of the most savvy, price sensitive phone plan customers in Australia.Now smaller phone companies offer the core of phone services capabilities and charge far less for them than either Optus or Telstra. If you want phone minutes, SMS and data from a phone company and this entertainment / content is not of interest, MVNOs are where to find it. Their ‘product’ (the network, minutes and SMS they offer) is the same as Vodafone’s or Optus’ except for branding and customer service. The network access component is identical whether you buy it from Amaysim or Optus, for example, or Kogan and Vodafone. This pressures Telstra to add in extra value to explain the premium they charge and pushes them towards offering entertainment as a way to justify it. As if competition from the smaller MVNO phone companies wasn’t enough, some of the bigger phone companies has been stimulating change too. And that has been seen. In fact, when it comes to recent moves around content. Telstra were, to a degree, caught napping. Telstra were not making the most of their entertainment options, despite a long running expertise advantage, having part managed Foxtel for so long. Optus’ announcement of the EPL rights they have acquired stole the headlines and brought content as a differentiator to the fore. It’s a major reason Telstra have had to react in the way they have and provide their customers Entertainment options. As you may have seen in recent news, Telstra are under pressure from the regulator to share their network with Optus ad Vodafone. It’s early days in the analysis and, for now, all sides are weighing their positions and making statements. But it’s a very real possibility that Telstra will be forced to open up it’s network of towers across Australia’s most remote areas. Some people even think it might be a good, if outlandish idea. But consider how Telstra would differentiate themselves and their phone plans, in a market where Optus and Vodafone had access to their bush coverage. No longer could Telstra charge a premium for their bigger network footprint – they wouldn’t have one. They would have to have a different way of demonstrating their value. Entertainment content might be one way to maintain their price premium and pushes Telstra towards it as a core part of their service. It’s not hard. The core question to consider when you are weighing up whether Telstra’s entertainment options might be right for you, are to consider whether you like the content on offer and the cost of that content. We discuss the multiple tiers of this system below. Broadly, the more you spend, the more entertainment / content you’ll get access too from Telstra. No surprise there. If it’s important to you, content is likely to be your first decision point, not your last. If you love football or Aussie rules, you’ll probably take whatever plan / phone company which offers it to you. If you don’t care about the NRL, you’ll probably end up a ) with a phone company which provides the content you do want or b ) with a smaller phone company / MVNO which offer the basics much cheaper. Telstra and Optus have video entertainment content built in to their higher level plans. Remember, you don’t get this entertainment option included as part of your plan until you are spending a reasonable amount each month. We see Australian entertainment offerings for phone plans (of which Telstra offer, the one were covering here, is simple a single example) as a 4 Tiered set. Smaller companies, MVNOs now provide basic SMS, data and voice services on the Vodafone, Optus and Telstra Mobile networks at a fraction of the price of the main phone companies. You won’t get zero rated, streamed video from these guys (with one exception – see tier 2) but you will get what people usually want from a phone company. A network connection, the ability to talk to friends and family, data to watch cat videos and a call center to ring if something goes wrong. You can see our MVNO plans on our SIM Only page. OVO mobile are both a network reseller and a content provider. You can read more about their somewhat unique proposition in our OVO mobile review. As well as what we consider to be industry leading inclusions OVO have agrowing range of Sport available to their users. They actually beat Optus to market with a very similar offering to what Optus are giving their customers. OVO are unique so they get their own tier. An MVNO with content. This article focused on Telstra’s Entertainment options. Every Telstra plan now includes streamed audio. That’s Apple Music for everyone on a Telstra plan from the lowest ($30) prepaid plan on up. It’s the price difference that’s significant here. Telstra’s broader entertainment options, with included access to streamed media – Tier 4, start at much higher price points. Optus have a similar but different entertainment offering. Telstra and Optus have video entertainment content built in to their higher level plans. Remember, you don’t get this entertainment option included as part of your plan until you are spending a reasonable amount each month. We have provided an infographic above about Telstra’s inclusions. This is the equivalent for Optus. 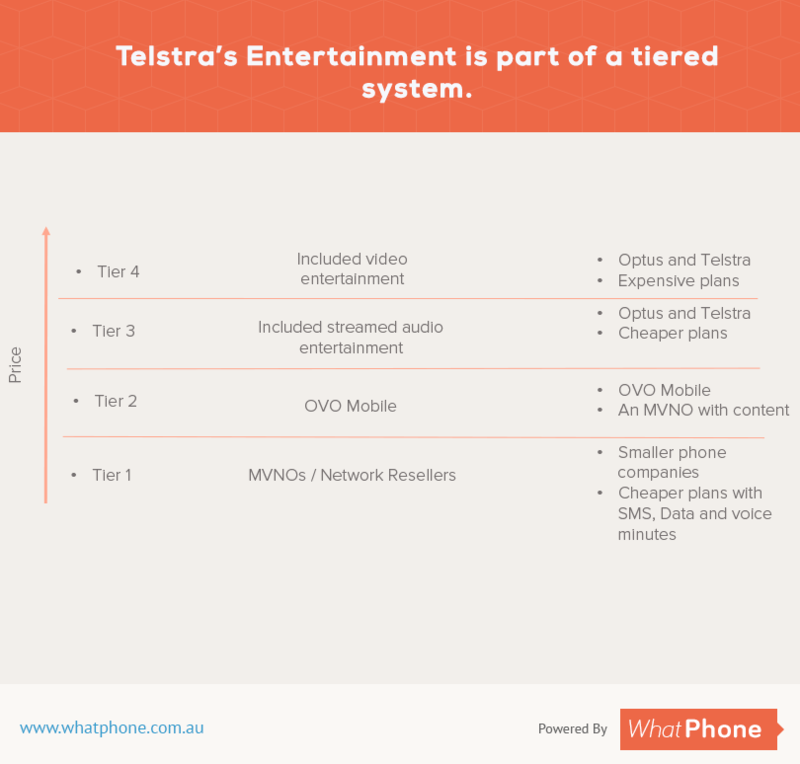 What sort of difference can taking a plan with Telstra Entertainment options make ? Check out these iPhone plans and the difference between tier 1 and tier 4. The difference is huge. Take a plan from a smaller phone company and you could save $500 over the course of your contract. Be clear why you need entertainment and whether you want it before you sign your life away. $500 is a lot of DVD rentals. What’s good about entertainment for Australian consumers ? The fact Telstra have the NRL and AFL app available to all their customers demonstrates that they have a facility hundreds of thousands of Australians value. There are two sides to some of these entertainment offerings. Choice, for example, can be a good thing. Too much choice, on the other hand can make it hard to make a decision. Here’s what we think the good things about Telstra’s entertainment options are. Below, we consider the alternative view. Access to tv shows, movies and other forms of SVOD as part of your phone plan is undeniably a new feature of the Australian market for phones. Its early days and we have yet to see uptake numbers. However, the fact Telstra have the NRL and AFL app available to all their customers demonstrates that they have a facility hundreds of thousands of Australians value. As we have seen, Telstra customers also have the option to choose a smaller phone company – Boost Mobile for example, which resell The Telstra Mobile Network (now with 4G) and get access to a lot of the Telstra network they want, huge plan inclusions but not pay for the entertainment. Telstra’s entertainment options do not come out of your data allowance. For the initial trial at least, when you watch Stan, Presto or Netflix on your Telstra mobile, your usage will be zero rated – that is, not counted against your plan. This was a huge risk for many phone users. Most people don’t appreciate just how much data a phone can use when it’s drawing down video. The fact they will avoid bill shock is a good thing. To us, it seems fair that the more you spend with a company, the more they will value you. We now have a tiered system with basic phone services (voice, SMS and data) at the bottom of the pile and included streamed video at the top. I went out for the day with a bunch of colleagues last week. The most notable element of the day was the number of times they had to connect to power to charge their iPhones. I’ve never seen anything like it. Apple are the worst offenders but they’re not the only ones. Most phone manufacturers, if you push them hard enough will confess that their phone batteries are only designed to last 2 years. When you buy a phone with a battery built in (as opposed to swappable) it has a certain number of charges in it. Consistently half charging and then recharging batteries is the worst way to manage them! The facts are that batteries wear out although we would all much rather ignore that reality.In to this mix, we throw Telstra’s entertainment options. Having access to streamed video will cause us to use our phones more than we ever have. It’ll use the screen on its brighter settings. It’ll burn batteries sooner and that is not a good thing. The idea of not one but three streamed video services being offered as an entertainment inclusion in Telstra’s plans sounds glamorous. To be clear, if you want to, you could get a 3 month free trial of each / every one of those 3 streamed video offerings at once. The reality, when you look underneath the covers is that many of the really worthwhile Australian content offerings have already been taken. Foxtel has owned this area for years. Netflix and the others are big players but they can’t renegotiate a contract that Foxtel signed years ago. That’s why you will struggle to get Game Of Thrones anywhere but on Foxtel, for example. The addition of this entertainment options has made a tough decision now tougher. We’ve explained how it works with infographics, tiers and tables but it’s certainly harder than it used to be to find a plan you love. The reason Telstra is spending so much money on advertising for it’s new entertainment offering is that it’s so new. That raises the question – is this a real need ? Entertainment / content as part of a plan, is, to a degree being foisted on us by the phone companies. They’re using marketing to convince us that we want it. Do you ? Remember, Vodafone’s network wasn’t always bad. In fact, recent improvements put them on a par with Telstra for 4G coverage and speed around Australia. Optus is wise to the risk of network congestion. That’s why they are splitting their phone plans between the 3G network and the 4G network. Telstra have had a tough year when it comes to network and they wouldn’t want to accentuate the issue. Video uses so much data, we hope they have done the requisite network planning and don’t suffer the way Vodafone did when their network ground to a halt. The risk isn’t ours, it’s the phone companies: If they’ve spent all this money on phone content and we don’t want it ….. what then ? God, I say it all the time and, what’s worse, I mean it. It’s an extremely interesting time in Australian telco. 5G is coming with unlimited bandwidth in around 2020. After that, we won’t have to worry about some of the complexities of cramming entertaining content in to a 4G network. Whether, with all these people on public transport streaming video, there will be enough network capacity to go around, in the meantime, remains to be seen. And questions over bandwidth are not the only ones which remain when it comes to the subject of Telstra’s entertainment content. Is the desire to watch streaming video on your phone a real need ? Maybe, maybe not. If you remember, when phones were initially released a lot of people felt they didn’t need them. Not you’d have to rip the mobile out of the cold dead hands of those same people who, after getting used to the idea, discovered they liked it and now can’t imagine their lives without it. The same could happen when it comes to streamed entertainment services on phones. Maybe we’ll all get hooked. Instilling the watch video when you commute habit in us, getting us hooked if you will is certainly the aim of these free trials being run by both Optus and Telstra. Then again, maybe we won’t. They tried to convince us to buy expensive ringtones if you remember that ? Entertainment facilities on your phone are not all good news, as we have seen. They will provide a lot more drain on your battery than you’re used to. That could mean you end up doing something simple as charging in the office as well as at home. It could mean that you forget and don’t have access to a service more often or, at the more serious end of the scale, it could mean you use the battery up sooner and it ends up running out after a year instead of two. And be clear. This entertainment is expensive stuff. 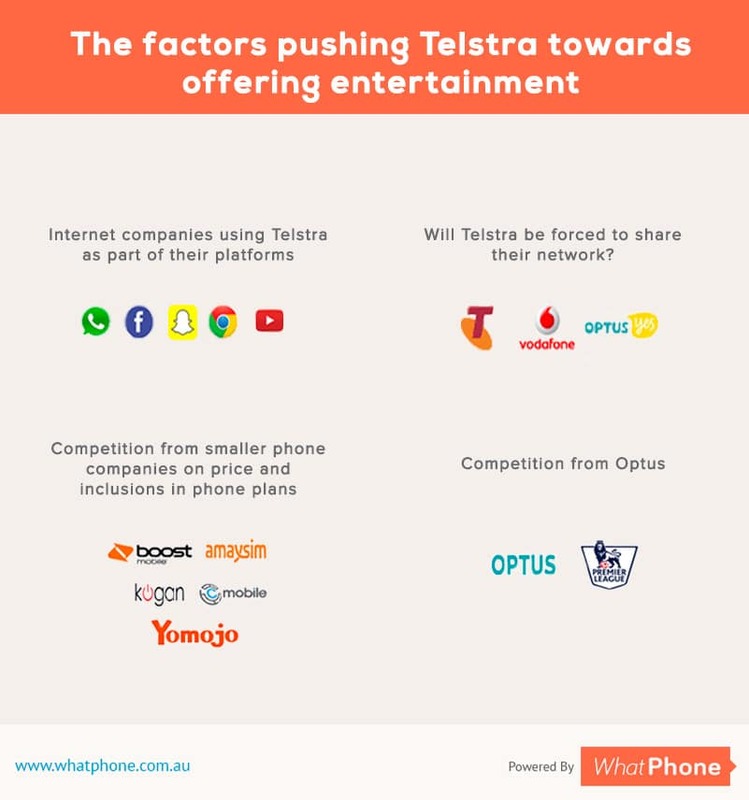 As you can see in the infographic on this page, the Telstra plans which enable access to all of the entertainment facilities they have are around $100 a month. Compare that with rivals like Boost Mobile which use the Telstra Mobile Network (now with 4G!) and charge a good deal less for a SIM Only prepaid plan. Is the extra worth it to you ? Entertainment on phones and phone plans is a problem which benefits from scale. Telstra have twice as many customers as Optus. That means that when they (Telstra) pay for a new license, for example, the distribution rights for a particular sports code over their network, to their users, they are splitting that cost over a larger base. It will cost half as much per customer for Telstra to provide these services as it would for Optus to do the same. Vodafone are smaller still which could be why we have seen so little from them in response to Optus’ and Telstra’s moves in the area. This scale advantage and their experience over the last few years owning and managing a significant part of Foxtel gives Telstra a notable edge and puts the balance of probability for success squarely in their court. For now, however, it’s Optus’ EPL right which have cut through in the Australian media. Once they are over their teething problems it’ll be interesting to see how that particular content acquisition ripples through the industry. We’ve already seen the effects it’s had on Telstra. Optus’ and OVO’s entertainment offerings have resulted in an Australian phone plan market place which is more difficult to navigate (4 tiers instead of 3) but which will, likely, as a result of the increased choice, make more of us happy. If we want a simple plan, there are plenty out there from MVNOs. If we want full entertainment offerings, there are layers of entitlement available. The risk isn’t ours, it’s the phone companies: If they’ve spent all this money on phone content and we don’t want it….what then ?